Photos by Lynda Kettle, no reproduction without permission. 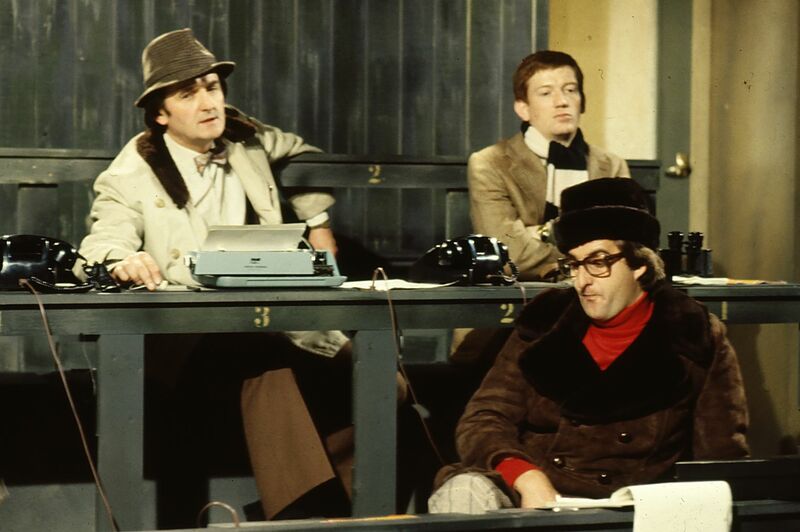 ‘THE BACK PAGE’, a Second City Firsts, went out on BBC TV 1978. It was written by Andrew Nickolds and Stan Hey, directed by Derek Lister. It was a comedy about sports journalists, set in the Press Box when Charlton Athletic are playing Notts County. A half hour studio piece, recorded in Studio A. It starred Graham Stark as Bert Reynolds, Henry Moxton as Percy, Howard Southern as Molotov, John Salthouse as Binoculars and Roger Avon as Sergeant. ‘The Back Page’ was produced at Pebble Mill by Tara Prem, Peter Ansorge was the script editor and Lynda Kettle the production designer.